21 Jump Street debuted on FOX in April 1987 and ran until April 1991. Created by Stephen J. Cannell and Patrick Hasburghm, the TV show is noted for propelling Johnny Depp to teen idol status (much to his chagrin) and for being one of the first hits for the new network. Each episode of 21 Jump Street revolves around a team of fresh-faced young cops who go undercover in high schools and colleges to intercede with troubled youths. Show themes include AIDS, sexual promiscuity, hate crimes, alcohol, drugs, and child abuse. Series regulars include Depp, Holly Robinson, Peter DeLuise, Richard Grieco, Sal Jenco, Dustin Nguyen, Steven Williams and Michael Bendetti. FOX cancelled the series after four seasons but it continued in syndication for year five. Depp and Nguyen didn’t make the jump. The complete series has been released on DVD and features all 103 action-packed episodes on 18 discs. Guest stars include Brad Pitt, Vince Vaughn, Jason Priestley, Josh Brolin, Christina Applegate, Bridget Fonda, Dom Deluise, Rosie Perez, John Waters, Shannen Doherty, Thomas Haden Church, and Kareem Abdul-Jabbar. You can purchase 21 Jump Street: The Complete Series (18-Disc Set) for $42.49 from Amazon. You can also try to win a copy here. Guidelines: This giveaway is open to participants with a United States mailing address only. (International readers can enter if they have a friend in the States who can accept their prizes by mail.) Many may enter but one person will win. You must be 18 and older to enter and no purchase is necessary. Contest ends August 18, 2010. UPDATE: Congratulations to “Berta” who won this DVD set in our contest. Thanks to everyone who entered. Stay tuned… more contests to come! 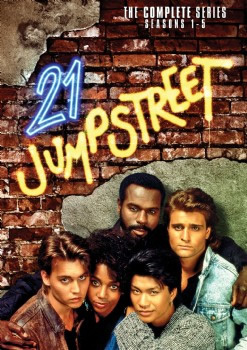 21 Jump Street was one of the best cop shows of the 80s. Haven’t seen the movie yet wanting to watch the series before I see it. Great Show! Used to watch it when I was growing up! Dustin Nguyen! One of the few known Vietnamese actors in America. It say you can enter once per day. Here my 2nd entry. I love this show. I would love to win. I miss this show so much! Good times! 21 Jump Street was a couple of years before my time. I’ve seen episodes and I would compare its addictiveness to current shows like Degrassi (because that IS a show my generation adores) minus the teen angst. The episodes I have seen sparked my love for all the actors and allowed me to really appreciate how far they’ve come in their careers. Jump down on Jump Street! Would be so cool to watch all the way thru! Entering once more before the close of the contest. : ) I hope I win. fingers crossed thanks for the opportunity to win!!! I would like to watch the whole series. I have been visiting this site daily. not a show i would pay for but hey if i can win it for free than why the hell not. I saw an episode of 21 Jump Street once, I would like to see the whole series.